No matter what age you are, thinking about outer space and all the possibilities is always appealing. So why not bring some space-themed activities into your makerspace? You can use the following activities in conjunction with an event, such as a STEM night or book fair, or you can use them as stand-alone activities or stations you set up for your students. 1. 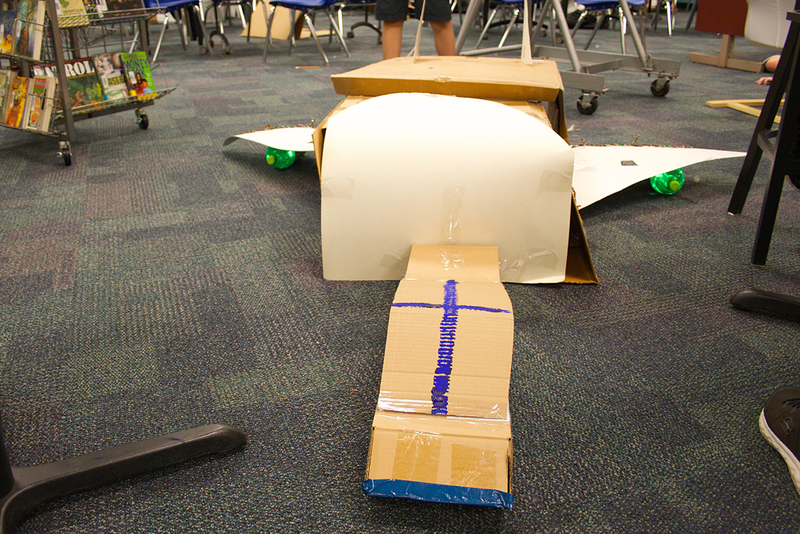 Cardboard Challenge: Robots, Aliens, Spaceships! The official date for the Global Cardboard Challenge is always in October, but that doesn’t mean we can’t celebrate with cardboard challenges all year round. 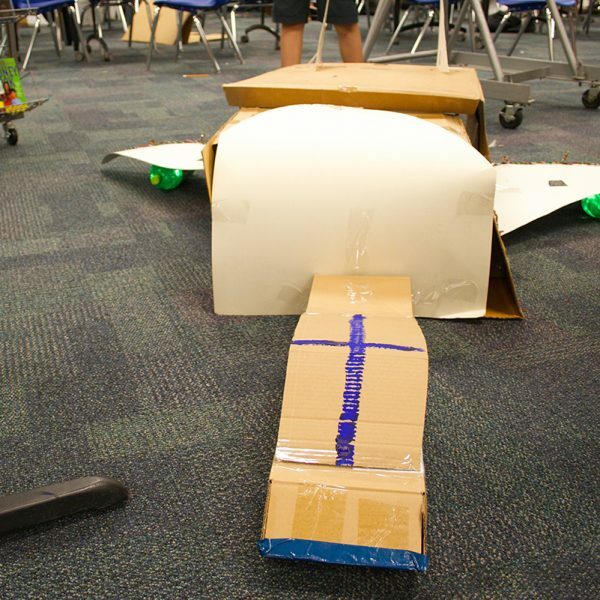 Supply students with cardboard, old electronics parts, and recycled materials and challenge them to create a robot, alien, spaceship, or other space-themed cardboard creation. They can be inspired by books they’ve read or come up with original ideas. This could be a drop-in station in your library or a special event. 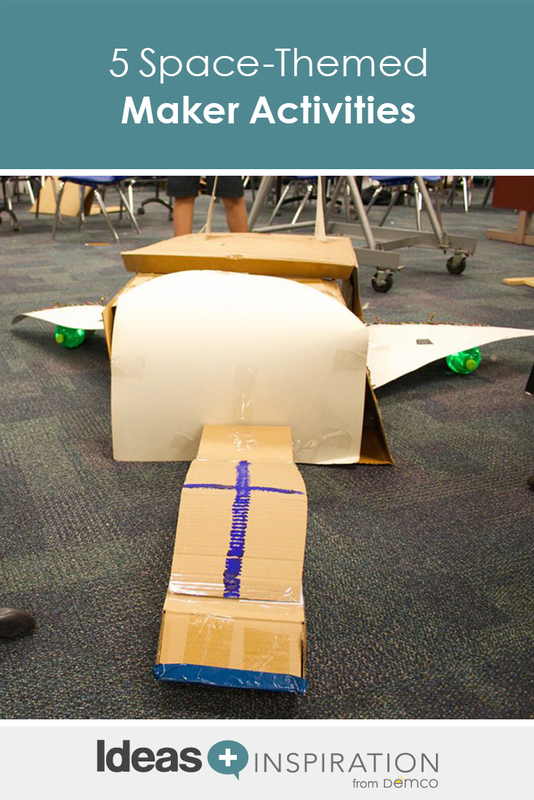 If you’re working on the challenge as a group, include sharing time at the end where students can explain their designs and the stories behind their creations. Or, record students sharing about their creations and compile the recordings to make a video. Galaxy slime is easy to make with a few ingredients, including glitter glue and food coloring. Check out the recipe here to get started. Or, do a search on Pinterest for slime recipes. Simply adding glitter and black, blue, and purple food coloring to any recipe that uses clear glue can work. Supply small plastic condiment cups or snack-size plastic baggies so students can take their slime home. Galaxy Sharpie© Art is a fun (but messy) activity that works best on fabric or paint canvas. Have students start by drawing the first color with a permanent marker (black or dark blue). Then, have them use rubbing alcohol on a paintbrush to blur the marker and create a tie-dye effect. Let them experiment with different designs and patterns to find what works best. Continue to layer on other colors, such as purple, light blue, etc., to help create a galaxy effect. After the marker and rubbing alcohol have dried, have students top off their designs with white paint, T-shirt paint, and/or glitter to create stars. Cover the tables underneath with cardboard and/or plastic bags to prevent staining, and have students wear aprons to protect their clothes. (Note: This is best for older students since there’s a possibility of staining clothes). This is a simple and fun activity that you can display in your library or makerspace. StickTogether posters are fun, interactive displays that allow students to work together to add stickers and gradually reveal works of art. The Starry Night poster is a perfect fit with space-themed makerspace activities and could be especially good to have up during a parent night event. Check out this post for ideas on more ways to get your students engaged with StickTogether posters. 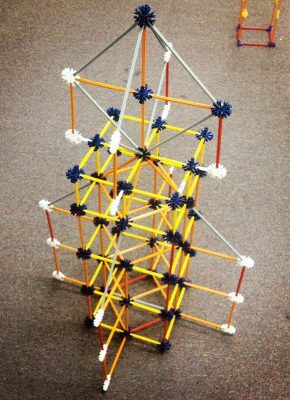 A K’NEX rocket challenge is a fantastic passive maker station activity, but you could also do it as a part of a club or program. For a passive station, create signage with a design prompt challenging students to build a rocket ship out of K’NEX. As students finish their projects, put them up on display and take a picture of each one. Before long you’ll have a K’NEX rocket garden in your library. Share images of your students’ creations on social media and print them out and post them in the library as well. 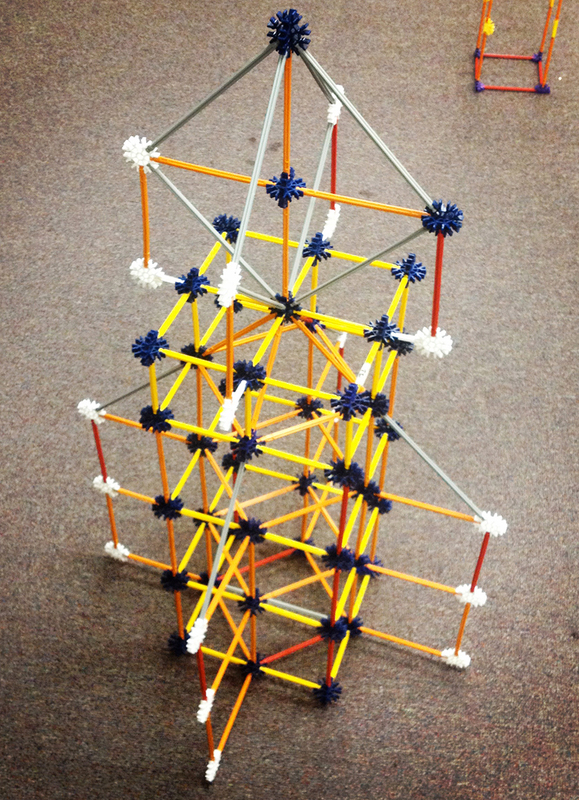 If you don’t have K’NEX, you could also use LEGO® bricks, Strawbees® or other building tools for this challenge. Constellations have fascinated humans for as long as we’ve been looking up at the stars. So, it makes sense to have some arts-and-crafts projects that revolve around them in our makerspaces. For these makerspace activities, pull some books from your nonfiction section on constellations and astronomy to use as a reference point. Constellation Projection: This is a simple activity that uses a flashlight and black construction paper. Have students cut out a piece of black construction paper to fit exactly over the light part of the flashlight. Then have them draw out a constellation on the paper and gently punch holes using a needle or pencil lead where the stars will be. Next, have them tape the paper to the flashlight (electric tape works well for this), and then turn out the lights and enjoy your own mini-planetarium show! Constellation String Art: This fad from the 70s is back! Depending on what type of makerspace setup you have in your library, this could be done with scraps of wood and a hammer and nails or with cork trivets and pushpins. First, have students research and draw out the constellation lightly using pencil on the wood or cork trivet. Then, have them hammer nails or place pushpins where the stars will be. Using thread or yarn, they’ll then wrap from one pin or nail to the next until they have their constellations. Marshmallow and Spaghetti Constellations: This is a classic STEM activity with a space twist. Have students stick dry spaghetti into marshmallows to create replicas of different constellations. If you have Strawbees, they could work well for this activity also (just don’t try to eat them!). These are just a handful of different ways you can bring the galaxy to your students and put the “space” back in your makerspace activities. Reach for the stars in your library and watch your engagement soar!